From the very beginning, music filled every crevice in my home. My Mom was a Kinks fan while I curled up in utero which might explain why songs by that band are my favorites on The Darjeeling Limited soundtrack. My Dad plays music by ear, so strums of guitar and the tinkling of piano keys are comforting, childhood memories embedded in my brain. He'd hear a song he loved, sit down at the piano (or pick up his guitar), and just play it. He loves hymns and other genres, and led music at Church camps. He wrote a few songs, too. My Mom was hesitant to perform, but she sings the sweetest harmonies you will ever hear; her voice is beautiful. Papaw was a Baptist minister of music, ever-singing. Aunt Pat sings a warm, honey alto. Even my brother has a great voice, though when we were little, he was more likely to take the comic route and entertain us with Rick Astley or Michael Jackson (Thriller) impersonations. Me? I always loved music. It was sort of inevitable with all that talent surrounding me. I wore out my Annie soundtrack cassette tape singing every single word in the safety of my Pepto-pink bedroom. My parents kindly purchased a replacement, much to my delight. I sang in Church and school choirs, but I was never comfortable with sharing my voice. Not even with my hero, Papaw. I've confessed before that one of my biggest, deepest regrets in life is refusing his repeated request, "Won't you sing with me?" I selfishly nodded side to side. I also remember sitting next to Nina in Church. She said, "Your voice sounds like an angel." I smiled and felt grateful for the compliment, yet I wasn't about to sing a solo for her, either. And it shouldn't surprise you that every boy who caught my eye, or that I dated, was either a musician or an avid music-lover. I was certain I'd end up marrying a guitarist, but once I heard Johnny play drums, I was perfectly content with my error as long as I married a musician - specifically, him. As it turns out, 95% of our close friends are musicians, or married to one. Go figure. Confidence has never been my forte, not to mention that I worry way too much about what people think. Thankfully, this vice has diminished as I've grown older, even while suffering health-wise the past year and a half. It's like I could care less about things that seemed so damn important before. Today, what really matters to me is the gift of health restored, my husband, our marriage, a peaceful home, and making it ready for the future pitter-patter of little feet. And, I've realized what I love to do. I love to write. My Mom said that when she and my Dad switched me from one school to another, they demanded I be placed in advanced reading/writing classes. She knew early on (as all Moms do) that I was to be a writer. I, on the other hand, didn't really clue in to this until several years ago, though I do recall my favorite class in high school - AP English - and the strong desire to learn to write. But I never really tried; I just admired my friends who were brave enough to put their words out there. Likewise, I love music deep within my soul. I love to sing. I am no performer, but I cannot run from desires that God planted inside me long ago. Just this morning as I tended to breakfast dishes, I turned on a CD quite loudly, nudged my voice to wake up, and sang merely for the pleasure of it. I played 1-2 songs in particular over and over and over. I marveled at the lyrics, the chords, the sounds. Unfortunately, I'm even timid to belt it out in front of Johnny at times. I trust him implicitly, but I've always loathed being the center of attention. It's pretty uncomfortable - to be vulnerable. But when I didn't think he was really listening, a few times he said, "You have a great voice." This astounded me because what I hear is a voice that can match pitch, but weakly. Actually, if I'm forthright, there's been a few times since I turned 30 where I thought, "Hmm. I think my voice has grown up a little; matured. I sound better than I used to." Singing around the house is a given, but Johnny hopes I'll muster up the courage to sing in our small Church choir. Not shockingly, I'm nervous at the prospect. I enjoyed singing in my massive high school choir, but our Church choir is all of 6-8 people; all men except for the female pianist. There are many times while worshiping in the congregation where I literally long to be in the choir, so I probably should give it a try one of these days. But I'm waiting for a few more ladies to sign up. Then I'll be more at ease offering my alto/mezzo soprano. Another thing I've learned while struggling for health is how silly and crippling fear really is. It imprisons us from doing what we're called to do which is often what we love to do, even if it's hard work. God gives each of us intentional gifts and we are to use them. I'm definitely not the next Emmylou Harris, but I do revere music. There are times I'll hear a song - like The Boss' "I'll Work For Your Love" - and I'd kill to play that fantastic piano part myself. Well, all the sudden, Johnny up and decided that he wanted to learn guitar and piano - to improve his drumming and contributions to our Church's music. True to his nature, he did it straightaway. And after one month, he can strum our favorite hymns ("Let Thy Blood in Mercy Poured", "Deck Thyself, My Soul, with Gladness"), or annoy me with wretched Cameo and Cher songs. Without a doubt, I prefer the hymns, or the song he's currently writing. I love, love to hear guitar filling my home again; Johnny singing and working out each note (I married a guitarist after all). But then I realized, I want to play music, too. And so, I've picked up the guitar myself. 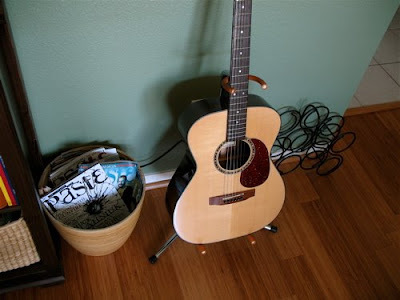 When I wanted to learn in my 20's, my parents gave me a beautiful acoustic guitar. My Dad taught me the chords and recognized, "If you keep at it, you'll be a great guitar player." I took a few lessons from a friend, too, but then - and this is the story of my life - I told myself I could never do it and set the instrument aside. Lately, though, a belief has surged within me that age 33 is absolutely not too late to write a book, or learn to play guitar. Today I picked it up, opened our book of guitar chords, played A, D, and E major correctly, and strummed all three several times; plucked each note. That simple task made me grin ear to ear. It felt right to hold that guitar; like it was meant to be. I also abandoned piano (as a little girl). I'm not sure what happened there because I took lessons for awhile, and loved to play "Chopsticks" and silly monster song-duets with my Dad. Yet thank God, it's never too late to redeem my cowardly/slothful ways. Last week I stepped out to Johnny's drum studio and rolled his desk chair over to the keyboard. After 2-3 attempts, I played the piano scales I learned all those years ago. I childishly laughed at "Chopsticks" once again. Guitar and piano have now been added to my hobbies and who knows, I might get really ambitious and take a drum lesson. Actually, since I'm married to a music teacher, at some point I'll be taking guitar and piano lessons. Did you think Johnny would just let me teach myself? My writer-side will always be the strongest, especially as I learn to write better and better. But I keep remembering something my Mom said last year, "I think you and Johnny should write a song together." I laughed thinking, I am no songwriter, but recently I've thought co-writing would be lots of fun. Johnny's written a few songs already, and I'd love to see what our different approaches could produce. Johnny's strength is definitely the idea of a song - what to say - and mine would probably be smoothing it out poetically; offering my artistic eye. Writing this blog entry makes me skittish - admitting all this stuff I've been running from. But the Lord is very kind; when we stop running, He is always there. It seems extremely important (and urgent) to begin to enjoy learning, trying, messing up, moving forward at my own God-given slow pace, having fun, and improving each day and week. I want to wash lullabies over our children; sing along with their little voices. They will see their parents learning new things all the time. They'll hear homemade music, and see their mom scale walls of fear. I'm already planning to teach our kids to work with their hands in varied creativity. If they adore mathematics like their grandfather (and unlike his daughter), I want them to understand they can also love art. Johnny and I will do whatever it takes to see each child grow up confident and sure of who God created them to be. For all I know, they'll be accountants or biochemists, but whatever gifts they are given, I want them to dive headlong into the learning, the stumbling, and learning more. I want them to not fear failure, or learning slower than their sibling(s). Just learn, and learn well. ....Do I have other ambitions besides guitar and piano up my sleeve? I sure do: crocheting, knitting, a little sewing, cooking (I'm such a novice), gardening, learning more camera settings; and writing creative nonfiction, poetry, and fiction, just for starters. And since we plan to homeschool, I'm already geeked up to learn that classical curriculum, too. Our kids will so think we're nerds. That's fine by me. That is a wonderful blog entry. I didn't know you were shy about your voice - it is beautiful. I am using the classical curriculum for my kids. I love all the reading, which shouldn't surprise you!! Beautiful. Isn't it fun to be married to a musician? Some of my most favorite times with Gregg is when we're singing together as he plays his guitar. Keep up the work on the instruments. And keep on pushing yourself. There are great rewards ahead. PS. Thanks for the sweet comment you left for me. "...and see their mom scale walls of fear" is my favorite part of this post. God is doing so many amazing acts of beauty through you and I can't wait to see you and Johnny as parents! Amen, Jenni! Can't wait to read about when you join the choir! Nicole, I'll be talking w/you, too! And thanks, Stine and Jenny! Anyway, I relate to a lot you've written here.